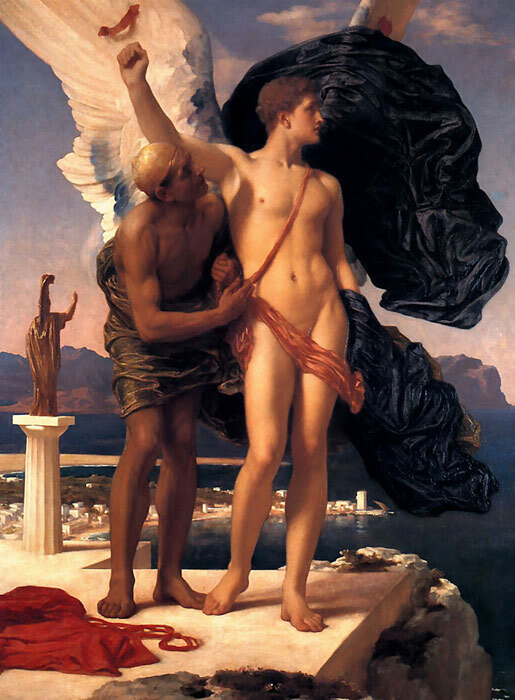 The reason that Lord Leighton was so successful during his lifetime is simple - his paintings brilliantly captured the Victorian nostalgia and longing for the glorious "Golden Age" of ancient Greece and Rome. In classically inspired oil paintings such as Clytie, Daedalus and Icarus, Idyll, and Greek Girls Picking up Pebbles by the Sea, Leighton depicted an idealized vision of the past that perfectly appealed to the sensibilities of the time. SPECIAL NOTE : The painter will make the reproduction as close to the original oil painting as possible. If you want your painting to alter from this likeness, please email us and " Daedalus and Icarus, c.1869 " will be reproduced according to your special requirements.